A new idea for an old product, fresh out of Erie. The humble home canning jar has been around for more than a century now, but innovation surrounding it has not stopped. Its popularity is enjoying a resurgence in a variety of arenas, from rustic wedding decorations to storage of dry goods, candy, and hardware. Borne of a desire to reuse or live a less disposable life, the glass mason jar is often the new go-to container. 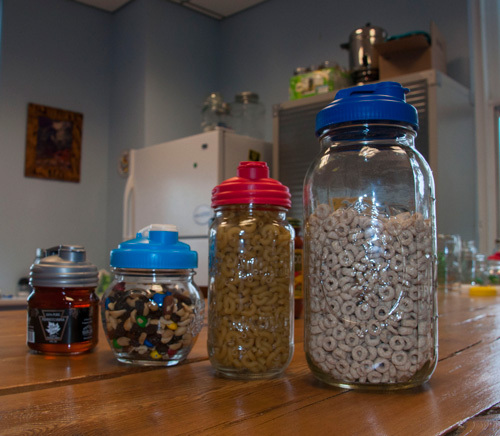 Local inventor and entrepreneur Karen Rzepecki stepped into the sweet spot of this revival at just the right time and is now making a business out of creating innovative reusable plastic lids in many styles for canning jars. 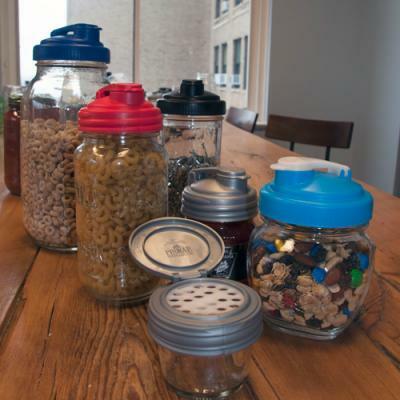 With her invention, mason jars can be used for lots more than preserving food. The original idea for the reCAP product came to be in 2011 when Rzepecki longed for a better top for the mason jar in which she made salad dressing. Unable to find one available, she decided to dream up a reusable lid that would seal effectively and have a pour spout. She entered the design for her new cap in the 2011 InnovationErie design competition and took home the prize. Some hard work, business advice, and a Kickstarter campaign later, her first product came to market in 2012. Mason Jars Company was on its way. Since then, the original reCAP Pour lid and its sibling — that fits a wide mouth jar — is now firmly established at brick-and-mortar outlets both locally and worldwide, and available online, too. The lids are made of FDA-approved, BPA-free polypropylene plastic (number "5"), which is recommended as the safest choice for food and beverages. And although the products are plastic, they are endlessly reusable, which helps reduce one-time use plastics, and supports a cleaner, healthier environment. It also reduces exposure to harmful chemicals. Their success has sparked new products, as well. The reCAP Mason Jars' Adapta Cap series features either a sprayer or a pump. "Many people are now making their own cleaning products in the home, whether to save money or reduce the amount of chemical usage," says Rzepecki. "The sprayer and pump help them store and utilize what they make more effectively. The pump allows people to buy hand soap and dish detergent in larger quantities, too, and just refill when needed. There's no need to purchase a new pump container every time." And for Rzepecki, it is all about reducing consumption and the reuse value of her products. The company sells replacement gaskets and flippers for the pour caps, so a consumer can just swap that component when it wears out rather than throwing away the whole product. The company also sells cover sleeves (like a can koozie) for insulating the jar, and offers on its website links to other sustainable accessories like reusable and biodegradable straws. Environmental issues are very close to Rzepecki's and the company's heart on many fronts. Last year, the company joined 1 % for the Planet, pledging to donate 1 percent of annual sales (not profits or proceeds) to support nonprofit organizations focused on environmental issues or sustainability. One of those nonprofit agencies, Environment Erie, is one of several charities chosen to be the recipient of the company's generosity. Rzepecki explains: "They have a lot of great programs that help both children and adults learn about protecting the earth's resources and they are a good group of people; they are very passionate about what they do." And while the company is committed to sustainability, it is also committed to quality and growth. In August 2014, Mason Jar Company moved into new offices at the Renaissance Center and now employs four people full-time. "Being there allows us to collaborate with other small businesses," remarks Rzepecki. "The space is beautiful and the location is perfect." New products are in the pipeline, too. First up is a two-inch-wide flip cap that will be on the market soon. The Flip will allow a user to store a wide variety of items that need a larger opening. The Flip also comes with two sizes of screens for sprinkling powered products like grated cheese, flour, herbs, or any fine dr y material. Next up will be the Explore Cap, designed specifically to get children outside. The Explore will feature a magnifying glass on the top and air holes so children (or those young at heart) are able observe insects without harming them, or build terrariums in glass jars that are probably already available in the home. To make it more widely useful, the company has formed a partnership with Environment Erie that will be creating lesson plans for teachers. That way, the cap can be utilized in the classroom. Further, reCAP will be donating Explore caps to the Environment Erie for use in their programming. Last year the company sold 140,000 caps, a remarkable feat for only its second full year. And, its products are now sold in nearly 500 locations around the world. Good timing, living in the place where more than 10 percent of American plastics are manufactured (that's Erie), and having the right skills and business acumen has made Karen Rzepecki and her company rising stars on the stage of Erie business. Who said you can't be sustainable and have a thriving business?